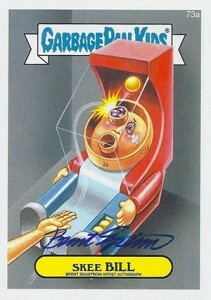 The Garbage Pail gang are back for more gross gags in 2014 Topps Garbage Pail Kids Series 2. Sticking with other recent releases, there are two types of hobby boxes, basic and Hobby Collector, which has a souped-up lineup with exclusive inserts. The 2014 Topps Garbage Pail Kids Series 2 base set has 132 cards. That's 66 different characters, each with the standard A and B variations. With the release taking on a sizable comic book theme, there are an addition 11 Super Hero C Versions (1:100 packs). Hobby Collector packs also have an Art Variant as a case hit. All base cards have several parallels. The most common are Black. Others include Silver (1:24), Gold (85 per card) and Printing Plates. Collector Hobby packs also have Metallic Red (one per pack), Canvas (one per pack), Character Back (1:24) and Sepia (1:48). 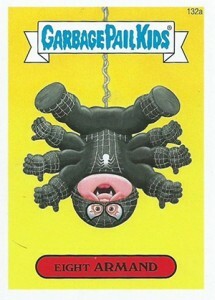 The superhero themes come through in a pair of basic inserts as well. 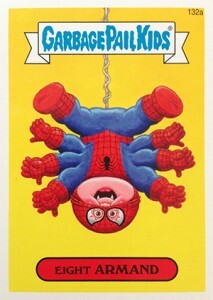 Superhero Battles (1:3) have GPK-style heroes laying the smackdown on each other. Each has two different backs, either Stats and Bios or Wanted Posters. 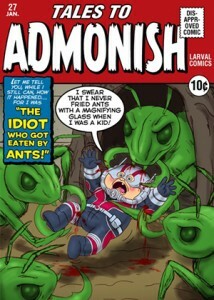 Full Card Comic cards (1:6) spoof popular characters and have their own comics on the back. Each hobby box also comes with one of eight Bonus Stickers. Also included in Hobby Collector boxes are randomly inserted Patch Relics (1:48). 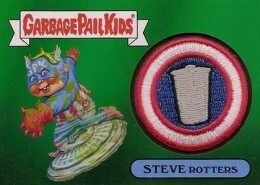 These come with a manufactured patch that goes with a featured superhero GPK. Premium inserts, not guaranteed in every basic hobby box, include Artist Autographs, Sketch Cards and Shaped Sketch Cards. Please note that this checklist is a bit of a work in progress. We're busy filling in the blanks and hope to have it finalized soon. 132 cards. Shop for base sets on eBay. 11 cards. Inserted 1:100 packs. Click here for a full visual guide. 5 cards. Inserted 1:192 Hobby Collector packs. Click here for a full visual guide. A large number of unsigned autographs have surfaced on the secondary market. 4 cards. Inserted 1:6 packs. 10 cards. Inserted 1:48 Hobby Collector packs. 4 cards. Inserted 1:4 packs. 3 Greed Dee vs ? 4 Team Upton vs ? Disappointed to see Bunk on this project. 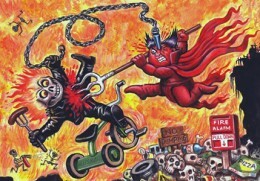 Just look at what appears to be Ghost Rider. Shocking, Madman Moore grinds THAT axe some more. 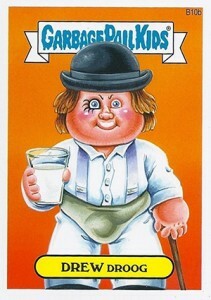 Whatev’…always happy to get some more Bunk in my diet, some of the only GPK that REALLY seems oldschool. scumbag jones � We’ve requested the full checklist and expect it next week. Loving this set! Bought 2 packs from a gravity feed box and pulled a sketch!!! Neil Camera.